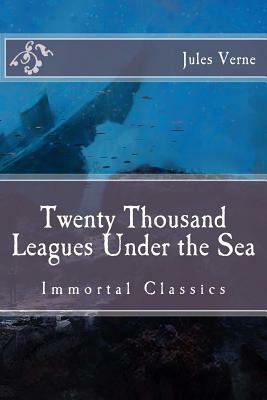 Twenty Thousand Leagues Under the Sea is arguably Verne's masterpiece. As a classic it has aged wonderfully well: it is escapist fun, but still retains its literary and scientific significance. To dismiss it as simply an adventure story does it a disservice. Yes, Verne's oceanic journey around the world is a ripping yarn, but it is also an eerie tale of isolation and madness, packed full with geographical and scientific accuracies that make the fantastic uncomfortably believable. The narrator, oceanic scientist Professor Pierre Aronnax is on a mission to determine the animal (or otherwise) nature of an unknown being attacking ships around the world. Aronnax, along with his faithful servant Conseil and the boisterous harpooner Ned Land, are kidnapped by their target, a horned submarine called the Nautilus. Their captor is the mysterious and charismatic Captain Nemo, an intelligent, quiet man who holds a strong grudge against all who live on land. A truly enjoyable read and one of the first science fiction novels ever written, it has been adapted multiple times for the screen. Jules Verne (1828 -1905) was a French novelist, poet, and playwright best known for his adventure novels and his profound influence on the literary genre of science fiction. Verne was born to bourgeois parents in the seaport of Nantes, where he was trained to follow in his father's footsteps as a lawyer, but quit the profession early in life to write for magazines and the stage. His collaboration with the publisher Pierre-Jules Hetzel led to the creation of the Voyages Extraordinaires, a widely popular series of scrupulously researched adventure novels including Journey to the Center of the Earth, Twenty Thousand Leagues Under the Sea, Michael Strogoff: The Courier of The Czar and Around the World in Eighty Days. Verne is generally considered a major literary author in France and most of Europe, where he has had a wide influence on the literary avant-garde and on surrealism.